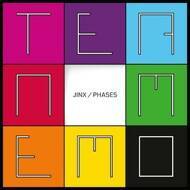 Following the introduction of enigmatic artist TERMOMENT via the KX 2015 label compilation (KX 10), we’re treated to his first solo release JINX/PHASES, an exquisitely crafted set of dance tunes for distinguished floors. As eclectic as they are forceful, these two cuts sport some pretty surprising twists and turns, while never letting go of their sweeping groove. Multi-layered and emotional, they find many occasions to chime with both techno and house crowds - true barn-stormers for advanced clubs.